I have always loved blazers, but the traditional blazers always look a bit formal and sometimes a little stiff. The oversized style, however, is a completely different story! If you want a laid back look that's comfortable and effortless but also a little chic... then the oversized blazer is the ultimate answer! I am wearing a classic and perfect-for-fall camel oversized blazer from Forever 21, paired with a black and white striped blouse from H&M, black coated jeans from Old Navy, and bow leather flats from Sole Society. Tossed my hair up in a ponytail and gave the look a little sass with a two tone snake embossed clutch by Lauren Merkin and the Beacon necklace by Lulu Frost. 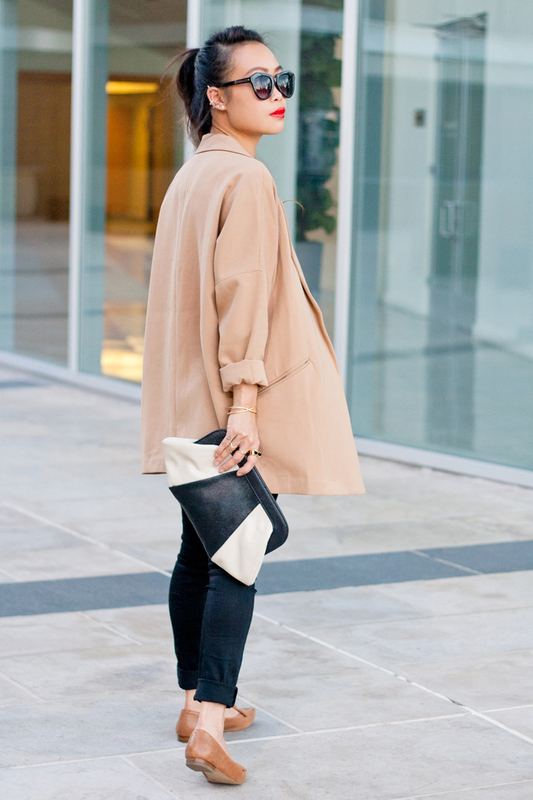 Camel oversized blazer c/o F21. Rockstar mid-rise black coated jeans c/o Old Navy. 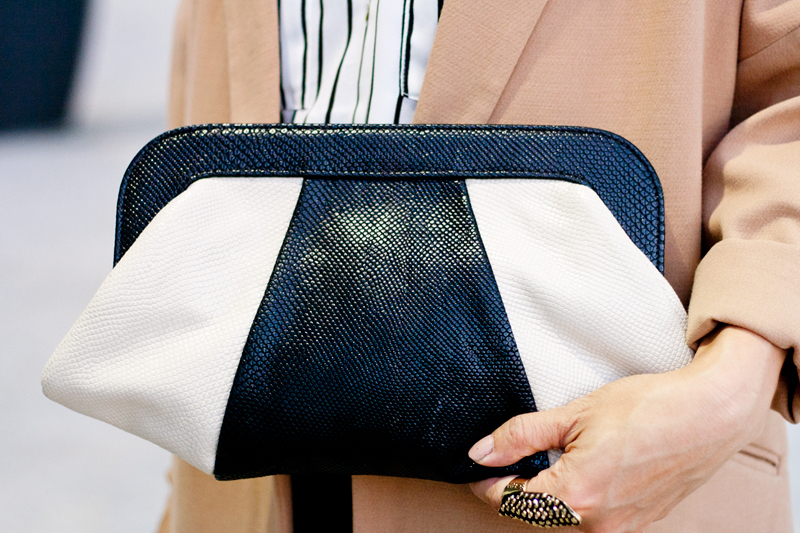 Tatum two tone snake embossed clutch by Lauren Merkin. 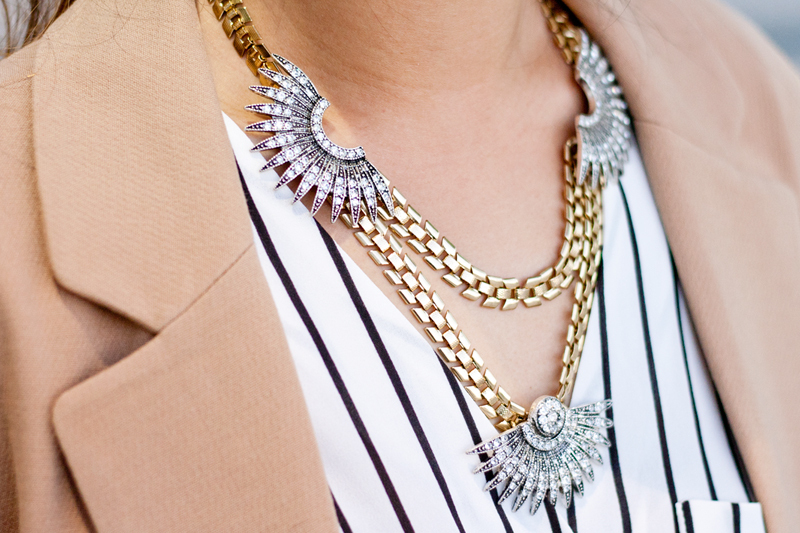 Beacon necklace by Lulu Frost. Shield glam knuckle ring c/o Boera. Double pyramid gold & onyx ring by Wanderlust + Co c/o Rocksbox. Elea cuff by Gorjana c/o Rocksbox. So chic!! Love your clutch and necklace. I agree - a regular Blazer is too corporate for me too!